Each phase of our life brings new challenges. For women over fifty, one of the challenges may be described as stubborn fat around the abdominal area. With our metabolism slowing down naturally with age, more sedentary lifestyles, and increasing hormonal changes due to menopause, we tend to store more fat around the waistline. The good news is that this fat can be lessened, but it takes a combination of lifestyle changes and dedication to keep it from coming back. Unfortunately, muscle mass gradually diminishes with age, so fat increases in the percentage of your total body weight. With less muscle mass, the rate at which your body uses calories, or your metabolism slows. When you take in more calories than you burn, fat increases. If you consume the same number of calories that you did when you were younger and more active, and you lead a more sedentary lifestyle, you will store fat. Factors that influence how much energy you burn are genetic and hormonal. Women experiencing menopause will produce more estrogen, because the cells are alerted to the fact that the ovaries are not producing enough. This results in cells storing fat in order to produce more estrogen. When the estrogen is produced, your metabolism slows, and the fat cells are not transformed into energy. 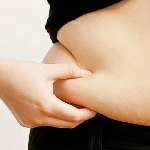 You are left with stubborn belly fat. Abdominal fat just below the skin is subcutaneous fat. It is of cosmetic concern, but does not pose health issues necessarily. Visceral fat lies deep inside the abdomen, surrounding the body's internal organs. An excessive amount of visceral fat produces hormones that can raise blood pressure, alter cholesterol levels, and possibly make the body insulin resistant, resulting in type 2 diabetes. Excessive amounts of either type of fat will increase estrogen levels, and may cause cardiovascular disease, breast cancer, and colorectal cancer. You cannot change the aging process, or genetic factors, but there are things that you can do to get rid of belly fat, and keep it off after age fifty. Because your metabolism is slower with age, you do not need as many calories per day, so cut back on your caloric intake. The United States Department of Agriculture specifies that people over fifty only need from 1600-2000 calories daily. If you start with a good breakfast, and less calories more often, this seems to help. When you eat more often, you trick your body by not giving your hormones a chance to signal to your brain that you are hungry. Also, smaller meals more frequently keeps your blood sugar levels stable. You will be receiving the same number of calories, only at different intervals. A crash diet will cause your body to store more fat for later, because your metabolism will slow further since your body signals that you need nourishment, so it would defeat the purpose. Improved diets include eating more whole grains, plant based foods, fruits and vegetables, and cutting back on foods high in cholesterol, saturated fats and sugar. If you eliminate any of these foods however, your body will be signaled, and more fat will be stored, so do not stop eating. Physical activity is critical, if you want to rid your body of abdominal fat. Strength training, also called resistance training, is the best way to get rid of fat in a certain area of the body. Strength training promotes the formation of muscle, and increased muscle mass boosts your body's metabolism, in turn burning calories, or fat. Resistance training exercises can be isotonic, where the body part is moving against force, or isometric, where the body part is stationary against gravitational force. Isotonic exercise would be lifting a weight repeatedly, and isometric involves positioning your body in a certain way to stretch muscles, but no body movement involved. These types of strength training exercises will tone muscles, and increase bone mass. Resistance bands, exercise machines, weight machines, exercise bikes, treadmills, elliptical trainers, or stair climbers, and swimming machines may be used. Exercise that is at least moderately intense, or enough to make you sweat, and enough to raise your heart and breathing rate is necessary to shrink those fat cells. It is suggested that you exercise for thirty minutes at least five times a week to promote an overall healthy body. In order to burn those fat cells, you will need to increase to sixty minutes daily. In addition to cutting down on the calories, the additional exercise will increase your metabolism, and burn the fat, shrinking the fat cells. For women, it is suggested that a waist measurement of 35 inches or more, may indicate an unhealthy concentration of abdominal fat. Stress can be another contributing factor to stubborn fat. If you are stressed, your body produces cortisol, and excessive amounts can cause your body to be insulin resistant. You may want to try meditation, yoga, deep breathing, or just walk it off. Many of us, when we are stressed, eat. You need to have a stress outlet which does not involve food. If you are not used to doing this, remind yourself, that in stressful situations, you will turn to a form of exercise. Dieting can be stressful in itself. If you focus too much on what you cannot eat, you are likely to crave it more. Change your mind by exercising, or doing stress-management exercises. Stubborn, belly fat weight loss will require a more diligent effort, and a long-term lifestyle change. The most important thing to begin with, is a visit to your doctor. It is important to rule out another cause of the fat, such as thyroid disease. Your doctor will be able to suggest a training regimen that you can live with, making sure that it is safe for you to do these exercises. Remember that you require fewer calories, due to slower metabolism. Change your diet, but do not exclude food groups. Avoid alcoholic beverage which are high in calories, and low in nutritional value. Losing this dreaded belly fat after fifty requires dedication, lifestyle changes, education, and most of all, patience. Life after fifty is just another journey, and you can lose the bulge if you are committed to the effort. David Grisaffi is a Sports Conditioning Coach and holds multiple certifications including three from the prestigious C.H.E.K. Institute: Level II Corrective Holistic Exercise Kinesiologist, Golf Biomechanic, and Nutrition and Lifestyle Coach. Plus he is also the author of the popular selling e book, Firm and Flatten Your Abs which teaches you how to develop a ripped abdominal region.